Professor Martin Gill of Perpetuity Research and the OSPAs has won two awards. On October 13th 2016 Martin was awarded the Imbert Associations Prize during the 2016 CONSEC Conference at the London Heathrow Marriott Hotel. The Prize is awarded to an individual in recognition of his or her significant contribution to the security sector for the year, as nominated by ASIS, BSIA, IPSA and the SyI, and adjudged by the Association of Security Consultants (ASC) Award Panel. 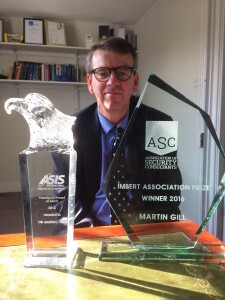 The Imbert Prize highlights the ASC’s mission to encourage the advancement of risk and security management in the U.K. The prize is named after former Commissioner of the Metropolitan Police Service and Lord Lieutenant of Greater London, Lord Peter Imbert, who has been a prominent figure in security and policing.